It gives us pride to introduce Kalaadaan – Share The Art initiative as a part of Daan Utsav – The Joy of Giving Week from 2nd October 2017 to 8th October 2017. To begin with, here’s a small introduction of Daan Utsav. Formerly known as The Joy of Giving Week, Daan Utsav celebrates the love, compassion and humanity through acts of giving. Here, giving could be money, time, resources or anything as sweet and simple as a smile and a hug. Daan Utsav is celebrated all over the country and starts on the day of Gandhi Jayanti (October 2) and stretches to a week (October 8). Different communities come together and take joy in the selfless act of giving. The festival, over its time of inception to now, has seen support of Media, Celebrities, Politicians and noted people all over the country. 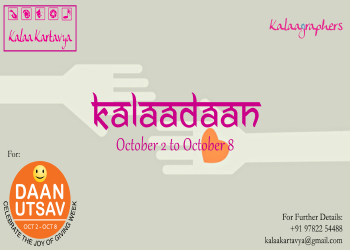 Kalaadaan – Share The Art is an initiative started by Kalaa Kartavya as a part of Daan Utsav. Kalaadaan shall cherish the joy of sharing the art and spreading love through the means of the art of an artist. Art or Kalaa is a sacred practice to Artists or Kalaakaars and is not just a part of their life but an integral part of their heart and soul. During the Kalaadaan, artists from various art fields shall come together and share the very piece of their heart with others. Kalaadaan shall be a collection of multiple small activities cherishing the joy of giving. We, at Kalaa Kartavya feel excited and elated to share the activities with you for Kalaadaan and to seek your support for the same. Kalaadaan – Share The Art initiative as a part of Daan Utsav- The Joy of Giving Week shall very well be covered in all leading media houses. Your cooperation and support for Kalaadaan shall highly be appreciated. We shall look forward for your response on the same. Let’s all join hands and come together in this joy of giving and sharing!